The letter of termination is what you get at the official end of a contract relationship. Whether decided by the employer or the employee, this letter is needed to leave an official paper trail documenting the final step. It not only has to provide for legal and operational purposes, however. A good letter of termination also makes sure both employer and employee part ways cordially and professionally. Template.net stocks literally hundreds of Letter Templates to help you draft a succinct, professional letter at every point in the contract relationship, from application to acceptance and termination. This is one of the most important letters you can get or receive in your career, so use these instantly accessible templates to show you how to do it well. When Do I Need a Letter of Termination? You can expect a letter of termination if you are ending your time as an employee of a company. But this applies also to situations where you are hiring services from a consultant or other professional. In both cases, the Contract Termination Letter is the way to end the contract properly and prevent any legal lash back. 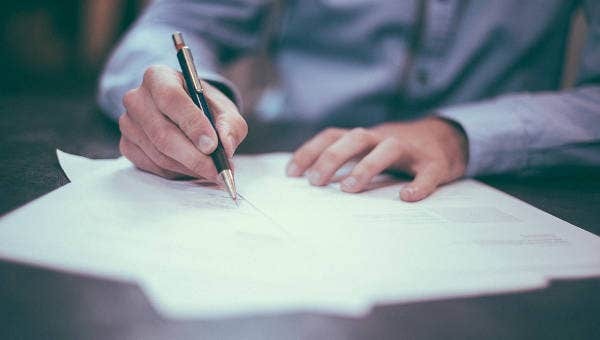 The initial contract is a legally binding document that ties the employee to the employer, and to end such a contract prematurely will require another legally binding document. That’s what the letter of termination is for. In some cases, the terminated employee will also have to draft an acceptance letter, which will serve to document receipt of the termination letter. If the termination is happening between business partners instead of between employer and employee, a Partnership Termination Letter might be more useful for you. Each letter sample on this list is available to download for free, either as a Word document or a PDF file. PDF files are great for reference, and you can modify the Word documents to suit your needs. 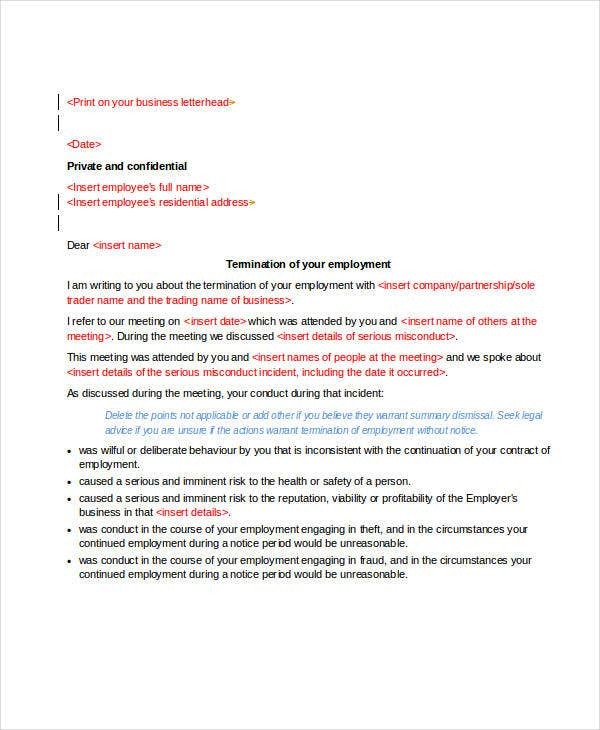 They are all examples of a Job Termination Letter Template, with some variation to suit specific circumstances. 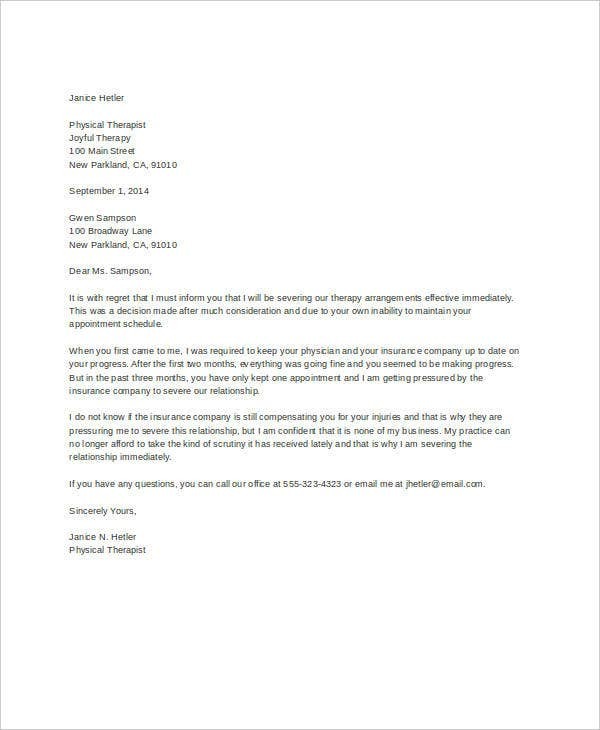 Therapy Termination Letter Template—to terminate your contract as a client for professional service, in this case a therapist. 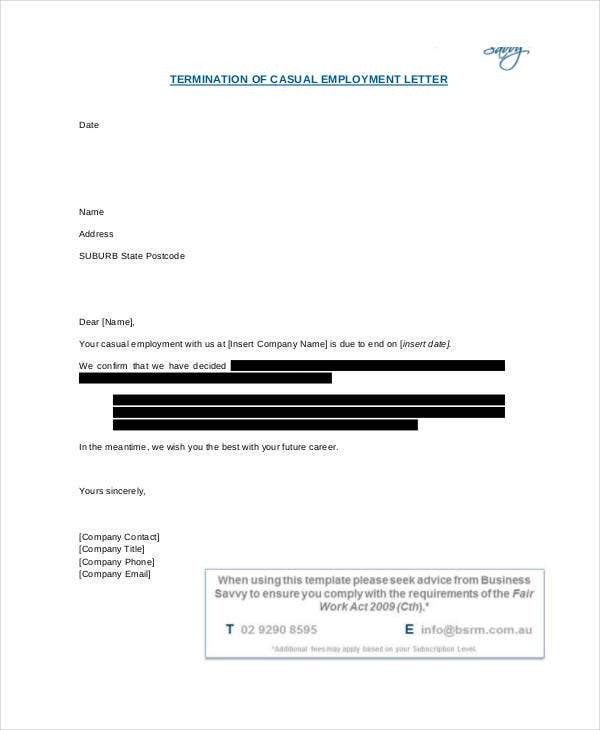 Termination Letter for Insubordination—an example of a generic employment termination “with cause” (compare with Breach of Contract Termination Letter). 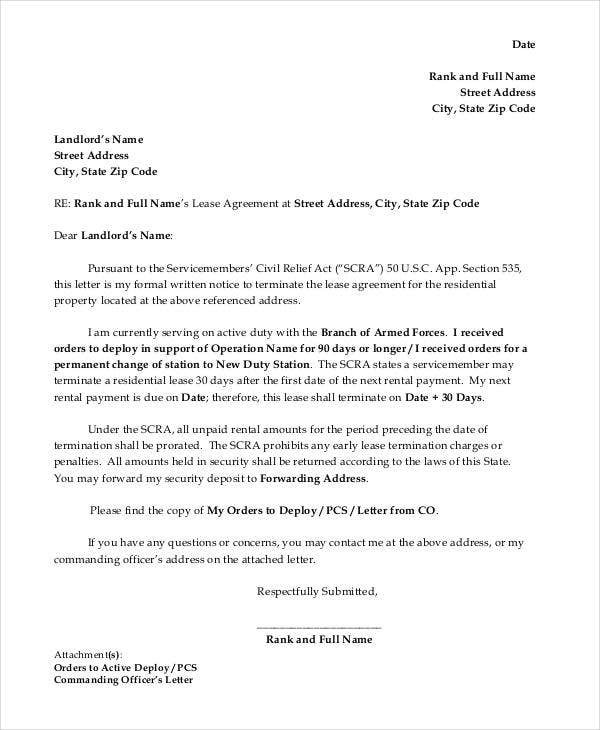 Formal Lease Termination Letter—an example for terminating rental contracts as a tenant (also check out other rental termination letters for both landlords and tenants). Termination of Credit Card Letter—for account holders to cancel a credit card account with a bank. 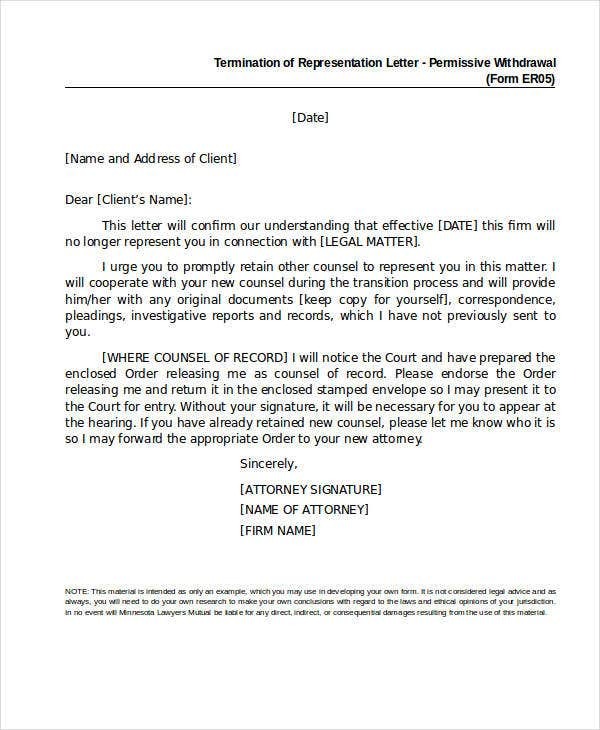 Termination of Representation Letter—for an attorney withdrawing from representing a client in court. 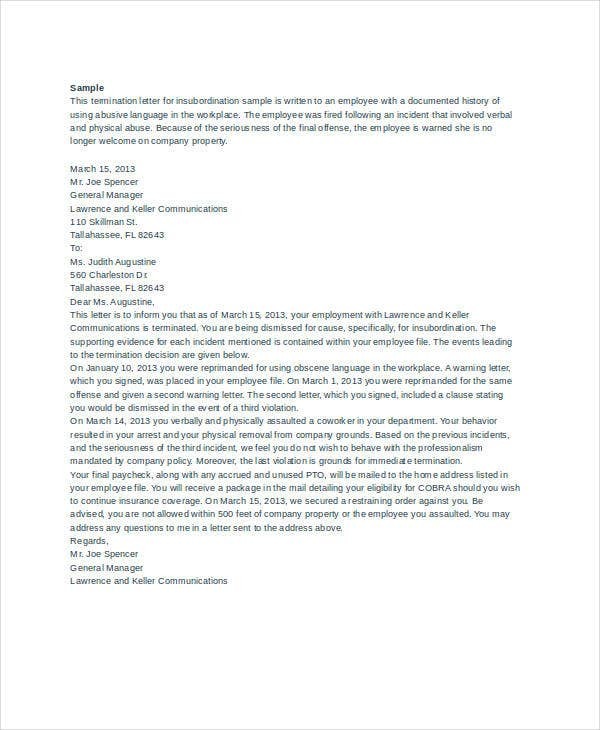 Termination Letter for Casual Employment—for employees who do not have regular hours with your company. 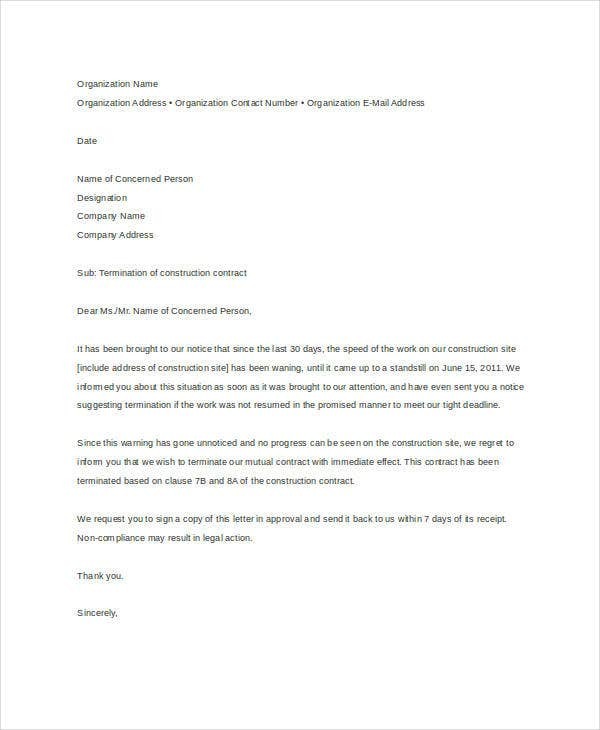 Construction Contract Termination Letter—for ending commissioned project contracts with an independent contractor; this can be modified to apply to other commissioned clients other than in construction. 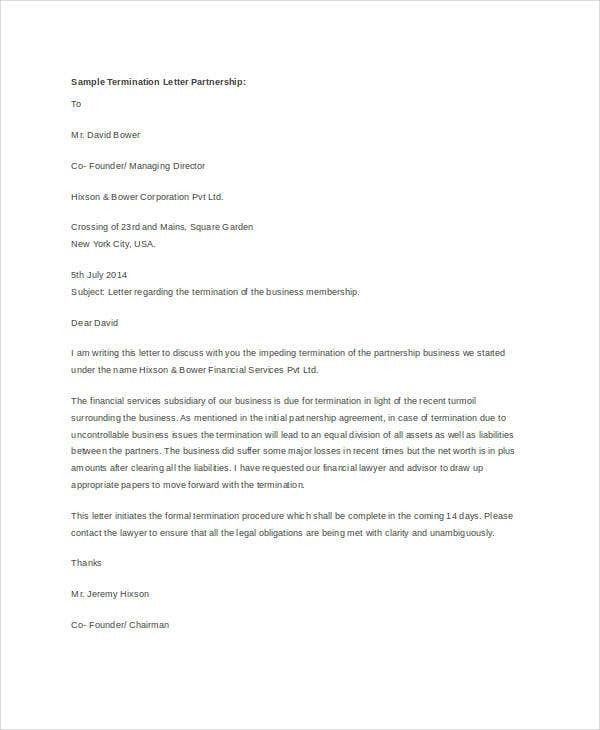 Partnership Termination Letter—for ending partnership contracts rather than employment contracts. 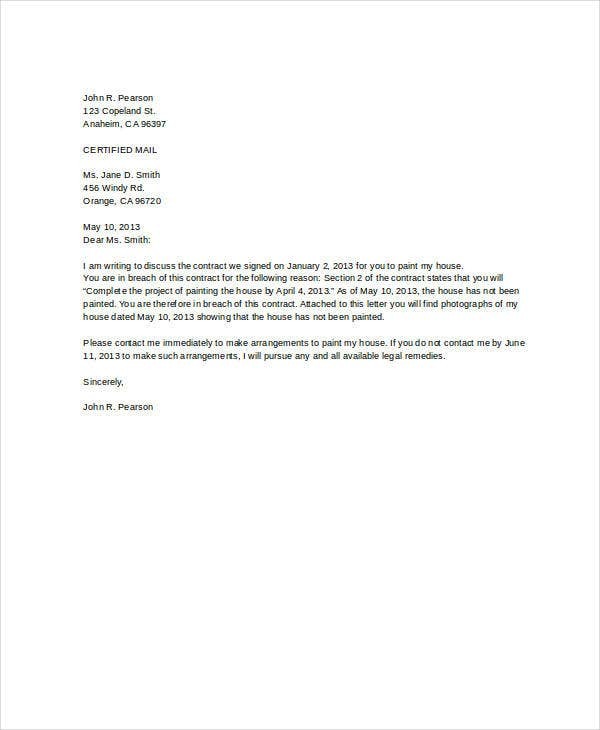 With these professional samples and many others on Template.net, you no longer have no excuse to end a contract poorly.